1. Halve the apple and place cut side down on a plate. 2. 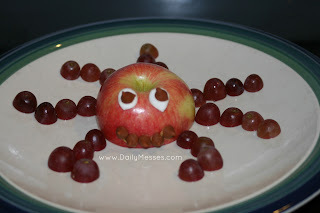 Halve the grapes and place around the apple/plate to make legs. 3. Cut mini marshmallow in half. Place sticky side down on apple. This is really cute! My daughter would be all about this! :-) Thanks for sharing. We'll have to try this soon. Thank you :) My boys loved it. It's amazing how fast they'll eat food that looks like fun. I hope she likes it.